It appears that some factories and department stores in North Korea have begun to implement a delivery service in response to customer demand. This new customer-oriented service seems to have arisen out of the Kim Jong Un regime’s goal of increasing autonomy and competition among businesses. Salespersons from Pyongyang Department Store No. 1 have also been travelling to power plants, mining sites, textile mills, farms and other worksites to sell products directly to workers and farmers. Other businesses, such as the Potong River Shoe Factory, have also been diversifying customer services. For example, employees now visit customers’ homes to measure shoe size and satisfy other requests they may have when placing an order for shoes. The Daedong River Passenger Transport Company in Pyongyang is currently offering a taxi dispatching service to customers who call in and request a pickup. 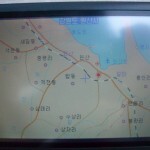 Similar to the workings of South Korea’s taxi service, North Koreans may simply dial “186” to be connected to the closest dispatch office, which then sends out a taxi to pick up the customer. Currently, North Korea has undertaken large-scale construction operations to finish the Kim Chaek University of Technology’s faculty apartments, the Pyongyang Orphanage and Nursery, the North Pyongan Chongchon River Power Plant and other projects spanning various fields. The goal is to complete these projects concurrently with the anniversary of the foundation of the Worker’s Party of Korea (October 10). At construction sites around North Korea, it appears that all available resources are being mobilized to engage in a so-called “speed battle” with these construction deadlines. The side effect of this huge emphasis on speed has resulted in many instances of poor construction, like the collapse of the 23-floor apartment building in Pyongyang’s Ansan-1-dong back in May. It has also been reported that corruption is taking place at factories and construction sites, with party officials or intermediary managers amassing riches by siphoning off materials and pocketing the money. This leads to further problems in product quality and defectiveness. In order to solve these problems, the article suggests implementing product standardization and specialization and encourages research in industrial design. The DPRK mobile communications industry has crossed the Rubicon, and the North Korean government can no longer roll it back without paying a severe political price. The most the authorities can do now is probably to manage its rapid expansion in such a way that will ensure that the interests of the political regime and state security are taken care of first. While traditionally, the State Security Department monitored most communications on a daily basis, the implication of this explosion of mobile phone use is that communication in North Korea has transitioned from a panopticon of total control to a voluntary compliance system where the government makes an example of a select group to try and force the rest of the country to stay in line. Alexandre Y. Mansourov, a Nautilus Institute Senior Associate, comprehensively examines information technology in North Korea. As of 2008 the regime launched a world-class 3G mobile communications service, which gained almost 700,000 users in less than three years of operation, revealing an insatiable demand for more robust and extensive telecommunications services among the North Korean general population. About the Nautilus Institute: Since its founding in 1992, the Nautilus Institute (www.nautilus.org) has evolved into a thriving public policy think-tank and community resource. The Institute addresses a myriad of critical security and sustainability issues including the United States nuclear policy in Korea and energy, resource and environmental insecurity in Northeast Asia. Over the years, Nautilus has built a reputation for innovative research and analysis of critical global problems and translating ideas into practical solutions, often with high impact. For more information, contact the Nautilus Institute at [email protected] or at 415 422 5523. Here is Yonahp coverage of the report. North Korea has begun to demand that every personal and electronic storage device in the country be registered in an apparent effort to crack down on outside information that may contain sensitive news about Middle East uprisings, a government source said Friday. The measure took effect early this year and has led to the confiscation of a considerable number of electronic devices, the South Korean source said, declining to be identified. The communist country is also allowing its notoriously harsh policing organ to have the right to approve the use of a mobile phone by an individual, the source said. More than 300,000 mobile phones are believed to be in use in North Korea, which strictly controls the flow of information in and out of its territory in an effort to keep its 24 million people brainwashed and make them conform to the regime. Pyongyang has ordered institutions and households to report on how many computers and even portable data storage devices such as USBs and MP3 players they own, early in 2011, according to a Seoul government source. The North Korean police agency is in charge of keeping track of the IT gadgets possessed by everyone, presses criminal charges against those who failed to report and even confiscates many of the gadgets, the source said. The reclusive communist state has been running a unit of authorities for years to crack down on North Koreans watching South Korean soap operas or foreign movies, which they call ‘non-socialist video’. Pyongyang is also reinforcing a crackdown on use of cellphones and the Internet. It is estimated that more than 400,000 mobile phones are being used in North Korea. North Koreans are required to get government permission to use cell phones. They are also banned from bringing them into the country or using cell phones bought overseas. Foreign members of international non-governmental organisations working in North Korea were also told to follow domestic regulations on cell phones. Certainly, a person with some technical knowledge can easily make the necessary adjustments and transform such a receiver into a real radio. To prevent this from happening, the police undertake periodic random inspections of all registered receivers. Controlling the correct use of radio receivers is also an important duty of the heads of the so-called people’s groups or inminban. The head of an inminban can break into any house at any time (even in the dead of night) to check for the possible use of a non-registered receiver. If a North Korean has access to foreign currency, he or she can buy a foreign-made radio set in one of the numerous hard-currency shops. However, after purchase the radio set was subjected to minor surgery in a police workshop — its tuning had to be fixed, so it could only receive official Pyongyang broadcasts (it appears this practice is declining in recent years). Of course it is questionable as to whether the inminban play a reliable role in “law enforcement” these days. Instead, individuals in these positions seem to play an increasing role in shielding their residents from Pyongyang’s dictates rather than assuming a pure-exploitation position. In the past we have seen how inminban effectiveness can affect local real estate prices. Also, when the government needed to apologize for the disastrous “recent” currency reform, they did so in person to the inminban representatives. 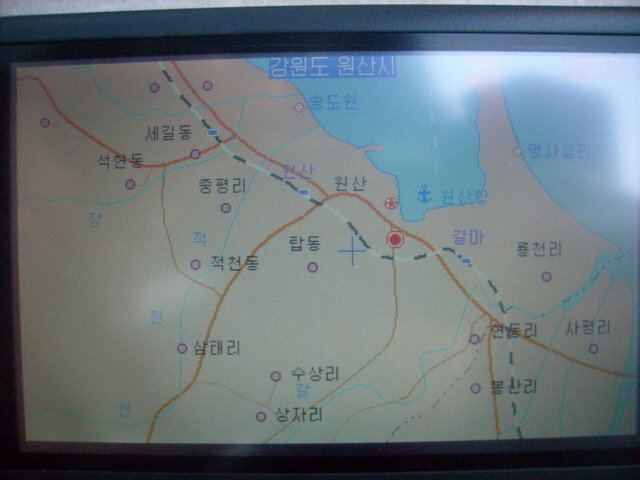 Given the proliferation of electronic devices, particularly in Pyongyang, in combination with the capacity of local police to carry out this mission, I believe the actual result of this policy will be the registration of “some” electronic devices along with the hiding and bribing required to keep others off the books. So inspection police just got a raise! The CEO of Egypt’s Orascom Telecom has been given a rare honor during his current trip to Pyongyang: an audience with Kim Jong-il and dinner hosted by the reclusive leader for the businessman whose firm owns a majority of North Korea’s only 3G cellular network. 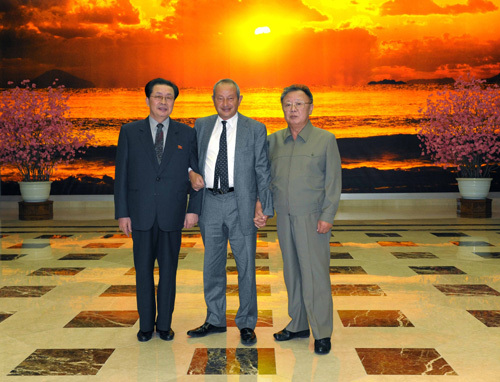 Naguib Sawiris arrived in the North Korean capital on Friday and was received on Sunday by Kim Jong-il, the Korea Central News Agency reported on Monday. Kim Jong-il, “warmly welcomed his DPRK visit taking place at a time when Orascom′s investment is making successful progress in different fields of the DPRK, including telecommunications,” the report said. Orascom holds a 75 percent stake in Cheo Technology, which operates North Korea’s only 3G cellular network. The network, the remaining stake in which is held by the government, uses the Koryolink service name. It has seen fast growth in subscribers and currently claims more than 300,000 accounts in just the two years since its launch. After starting first in Pyongyang, the network has been expanded to cover provincial capitals and smaller cities and a 3G signal is now within reach of 75 percent of the population, the company said in November last year. The Orascom group has made several other investments in the country. In 2007 it invested in a cement factory and in late 2008, at around the same time it launched the 3G network, it opened a local bank. The company has also been tied to renewed construction work at Pyongyang’s pyramid-shaped Ryugyong Hotel. The iconic building was halted in 1992 and has remained vacant ever since. North Korean leader Kim Jong-Il has met the head of an Egyptian company that provides a mobile phone service in the impoverished communist nation, state media reported Monday. Naguib Sawiris, chairman and CEO of Orascom Telecom Holding, has been visiting the North since Friday. His company has provided a mobile phone service in the North jointly with a local firm since late 2008. 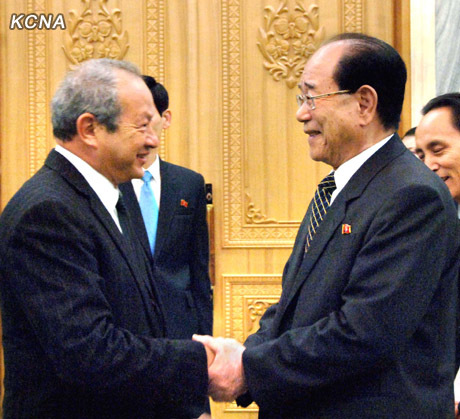 Kim “warmly welcomed his DPRK (North Korea) visit taking place at a time when Orascom’s investment is making successful progress in different fields of the DPRK, including telecommunications,” the North’s state news agency KCNA said. 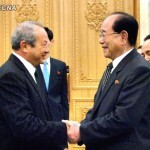 Kim had “a cordial talk” with Sawiris and hosted a dinner for him, it added. Orascom said last year that mobile phone subscriptions in North Korea had more than quadrupled in the space of a year — to 301,199 by the end of September 2010 from 69,261 a year earlier. However, it said overall “mobile penetration” remains at one percent in the country, which has an estimated per-capita GDP of 1,700 dollars and a population of 24 million. North Korea strictly controls access to outside information and fixes the tuning controls of radios and televisions to official stations. It began a mobile phone service in November 2002 but shut it down without explanation 18 months later and began recalling handsets. But in December 2008 the country introduced a 3G mobile phone network in a joint venture with the Egyptian firm. The Egyptian group in 2007 sealed a 115 million dollar deal to invest in a North Korean cement plant. It is also reportedly involved in completing construction of the 105-storey Ryugyong Hotel in the capital. Martyn has more at North Korea Tech. 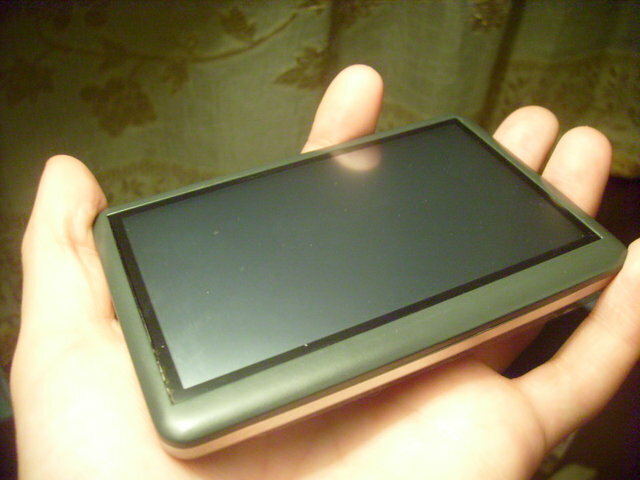 The device, which doesn’t appear to carry any branding, has a color touchscreen display that occupies its entire front, according to photos published on the “Pyongyang Show and Tell” blog. The Russian-language blog is maintained by a Russian student who is studying in the country. It’s not the first PDA in North Korea. 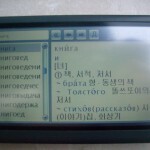 In 2003 the country’s media said “Hana 21,” a PDA developed by the Samilpo Information Center, had been put on sale. The device included English-Korean and Korean-English dictionaries as its main function and also had several games and a basic word processor. Input was by pen and touchscreen. “It’s still hard to buy for a Korean, but there are many people who keep their money for years and can afford it,” the student said via email. 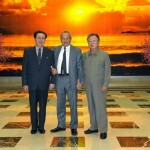 ORIGINAL POST: Show and Tell Pyongyang introduced the world to the DPRK’s version of Linux: Red Star. Now he has introduced us to the DPRK’s new Personal Digital Assistant (PDA). A few weeks ago in North Korea has started selling the first PDA. In all the computer shops you can see the advertising of the new items. [I] offer a small review of this device. On sale are a few options. The difference between them – is the amount of internal memory and a built-in slot for the stylus. The most feature-rich [costs] $ 140 and has 8 gigs of internal memory and a slot for the stylus, so you do not accidentally lose it. In addition, there is a slot for MicroSD memory cards – the same as in the local mobile phones. The main function of which is worth noting (and more generally for which there is a fly sabzh), an electronic dictionary Samhyn (삼흥) with the Russian language. It is no secret that South Korea produced electronic translators, but, according to eyewitnesses, the Russian language is absent in them as fact. 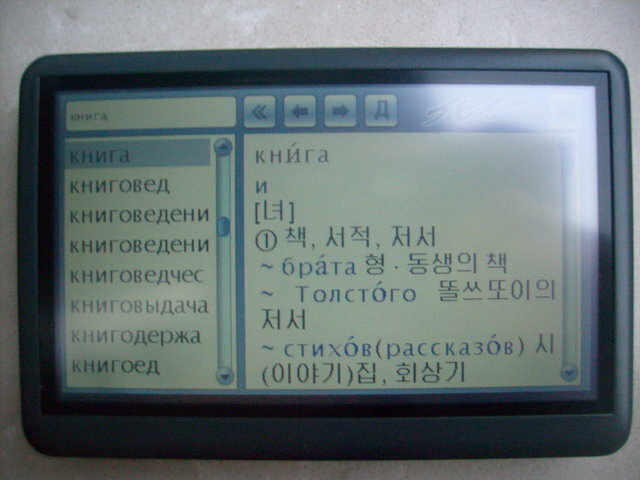 And in this case, Russian-Korean and Korean-Russian dictionaries most voluminous in the number of vocabulary words. Besides, there are English, Chinese and German. Also has a large Korean Wiki Grand Korean Dictionary. So for me personally, the main value of the PDA – is an electronic dictionary, which can carry with them always and everywhere. And the rest is not so important. On the whole – everything is simple and works quite well. At the moment, the firmware needs some work, not all features fully implemented, but the Korean comrades promise to update and refine. If anyone else has more information, please let me know. You are currently browsing the archives for the Telephones category.